This inviting terraced garden at Inveresk Lodge has been completely restored by the National Trust for Scotland. 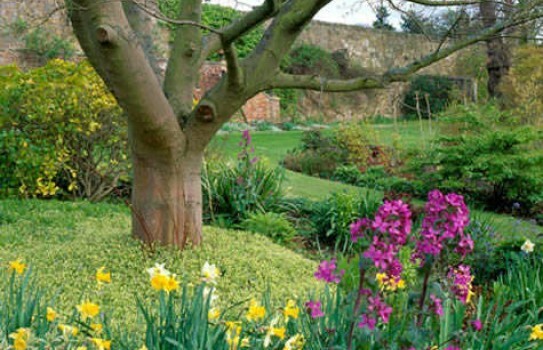 Inveresk Lodge Garden has has colourful herbaceous borders, a great variety of shrubs and a collection of roses created by Graham Stuart Thomas, with climbers on high stone walls. In all Inveresk Lodge covers around 13 acres. Autumn is a magical time at Inveresk. Trees and plants include include; Acer, Sorbus and Euonymus, along with a bountiful harvest of fruits in the Orchard, and the many berries on the trees. If you want to take a break near Inveresk Lodge, why not stay in one of our recommended hotels. Each hotel has genuine guest reviews enabling you to book from anywhere in the world in total confidence. Not only do we feature hotels near the garden, we also feature hotels worldwide and at all major airports. Special prices up to 70% off standard rates as well as hundreds of exclusive deals. Look now - click here.